to Build a Global City where you live/ own property or read below! Global City Ingredient #1 – Zoning Friendly to Walking & Mixed Uses! Miami’s new form based zoning code, Miami 21, encourages mixed uses & is pedestrian friendly. This means it’s easy, fast & fun to walk everywhere -where you to live, work, play, shop, sleep & go to school -because the bottom of the buildings are lined with retail uses & cafes! Global City Ingredient #2 – U.S. Protection of Property Rights! There’s a joke… “Miami isn’t part of the U.S.” but, buyers know Miami is one of the best cities to buy property where the U.S. Constitution, courts & police protect owner’s property rights. This is one of the reasons a foreign buyer from Argentina just bought Downtown Miami land for over $100 Million! Global City Ingredient #3 – Transportation Hub – Easy to Get To & Get Around! Miami is full of transportation options… int’l airport, sea ports, bus, metro. The growing City is a catalyst to new transportation options Uber, water taxi & walking! Global City Special Sauce – Sunny Miami Weather! Not to rub it in…but… while most of the U.S. & World are buried in ice & snow, the sun is shining on our global city! To learn more about the ingredients to build a World Class Urban City or to join the fun in Miami contact me, Suzanne Hollander Professor Real Estate®! 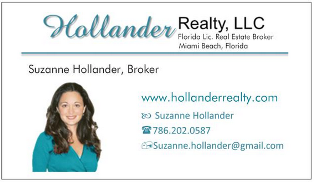 Hollander Realty LLC provides straight-shooter smart, confidential real estate services to sellers and buyers. Hollander Realty LLC provides smart, confidential real estate services to sellers and buyers of residential and commercial property. Professor Real Estate® provides real estate education for the nation, speaking and consulting to banks, lenders, foreign and domestic investors, real estate teams and individuals. Watch Professor Real Estate®TV for a sneak peek of some real estate lessons!